Volume 6, Issue 27; July 5, 2006: Are You a Fender? In December, 1972, about 117 hours into the Apollo 17 lunar mission, as Astronaut Eugene Cernan was loading the Lunar Rover for the mission's first excursion across the surface of the moon, he accidentally caught the right rear fender of the rover with a hammer. He damaged it, and made a quick repair that really didn't hold. Overnight, Houston worked out a more durable repair that the astronauts installed in the morning, and it held up well during two subsequent excursions. The Apollo 17 Lunar Rover, showing its damaged fender. Photo courtesy U.S. National Aeronautics and Space Administration. It's a good thing, too. 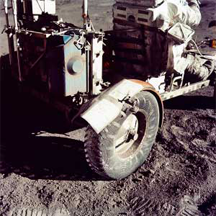 On Lunar Rovers, fenders are important. They protect the vehicle and the astronauts from the dust and rocks kicked up by the wheels. Fenders do something similar for cars, bicycles, and motorcycles. And sometimes, people serve an analogous role for their supervisors. At work, a fender is anyone who serves to prevent political mud from splashing on the fender's boss. Here are some indicators that you might be a fender. If one or more of your peers or predecessors (or their predecessors) were or are fenders, you might be one yourself. Sometimes it's easier to see in others than in yourself. Even though you have formal authority for something, you can't really exercise it without your boss's approval. For instance, if you want to initiate a replacement process or a performance improvement plan for a problem subordinate, and your boss insists on detailed involvement in the procedure, you might be a fender. In extreme cases, you might be told to wait for a "more convenient" time, or that a replacement requisition won't be available. Most managers handle some tasks through delegation, and some personally. But if your boss tends to delegate tasks to you if and only if they are high-risk politically, you might be a fender. The consequences for the individual fender are unpleasant enough, but the existence of fenders also harms the organization. While it might be OK to use an inanimate object as protection from the consequences of your actions, using human beings that way is unethical. Tolerating one form of ethical breach could be a signal of breaches elsewhere. To enable the organization to take corrective action, bad management must be revealed. Using a subordinate as a fender enables managers to trick the organization into believing that the problem was in the subordinate. This can lead to mistaken corrective action. For more about the Lunar Rover, see A Brief History of the Lunar Roving Vehicle, NASA Marshall Space Flight Center, 3 April 2002. And for more about the Apollo 17 mission, see Apollo Lunar Surface Journal,edited by Eric M. Jones, NASA Headquarters, November, 2005. Would you like to see your comments posted here? rbrenOWdHswkosDRSYrjPner@ChacoazTSTWAihGPqjKGoCanyon.comSend me your comments by email, or by Web form. I offer email and telephone coaching at both corporate and individual rates. Contact Rick for details at rbrenYIbbFvrdQpYboLVaner@ChacxHSAhkuhMkbZQlRboCanyon.com or (650) 787-6475, or toll-free in the continental US at (866) 378-5470.